Successfully Added Blue Laser Pointer Pen (50mW Super Executive Edition) to your Shopping Cart. New 50mW blue laser pointer pen for the business person who wants to have the latest fashionably cool laser color this year. This executive edition laser pointer has a solid feel and perfect form factor that will instantly make itself noticeable while the unique blue beam is as powerful as it is attractive. High Power, Special Color Laser: This laser outputs 50mW of light in the 405 nanometer wavelength which produces a very unique blue color (sometimes blue-violet due to reflections). Compared to the more common red and green lasers, the lower wavelength blue-violet is less straining on the eyes and much safer when pointing at reflective screens. This model laser pointer also has no infrared emission, making it the safest laser pointer on the market for using in classrooms and meeting room settings. Multiple Uses: This is the perfect tool for outdoor tour guides, astronomers, construction workers, engineers, facility inspectors, and law enforcement personnel. With a bright and powerful blue-violet colored laser, this laser pointer is the ideal tool for highlighting information and pinpointing important and/or hard to reach areas. Also great as toys for pets, especially for cats to play with. 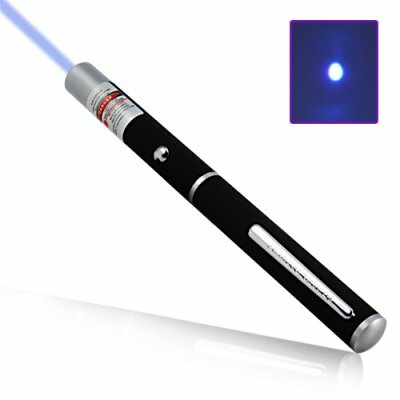 At only a fraction of the price of similar products, this unique blue-violet laser pointer is a great resale item for you to easily make some healthy profits. Put a few on your online store or sell them to your business associates when they all become jealous after seeing yours! The CVGF-G219 is available for single piece or bulk orders, so order yours today and we'll ship tomorrow! Brought to you by the leader in China Electronics - Chinavasion. This model is specifically designed to prevent accidental dangerous infrared emissions. This laser starts off with an output power of less than 50mW, but will become more powerful with usage. We recommend the use of rechargeable alkaline batteries to power this unit. Color changes from blue to blue-violet depending on usage and surface. WARNING: Like with all laser pointers, do not aim the laser directly at anyone's eyes. Do not allow children to use green laser pointers unless under the supervision of an adult. Important Note: Laser products of this strength (100mW) are restricted to official government use only in some countries. You are solely responsible for finding out whether this product is legal to import and/or use in your country. We will send you the products you order and cannot accept any liability for customs issues or any implications of your ownership or usage of this device.